This weekend I went to an axe making class. It was well worth the three plus hour drive because the class was taught by a world-renowned axe maker. When I got to the class I was happy to see I was back among the hairy and unwashed where Carhartt’s, beards and hickory shirts make up the dress code. I was sporting all three as usual. Among the nine students there were only three that I didn’t know. Meeting new people is a rewarding experience, but learning and forging with good smiths that you are comfortable with is one of those rare lifetime experiences. The instructor has made a name for himself forging axes and other tools that replicate the traditions of Vikings and Norwegian smiths. He has traveled much of Europe learning the art of forging steel. Contrary to the stereotype of the large bearded blacksmith using brute strength to bend iron and steel to his will. The instructor is a very precise person, a student of every aspect of forging from removing coal dust from his coal bag, to traveling across the continent in search of a very specific, as of yet, unobtainable steel. The plan for class was to take a piece of mild steel 2 inches by 6 inches and fold it into a U shape then forge weld the pieces together forming the hole or “eye” for a handle. A small piece of tool steel would then be added to the tip to make the sharp “bit of the axe.” All and all a very simple process, granted the devil is in the details. Making a uniquely Norwegian style “eye” in the axe requires some specific tooling and a few extra steps in the process. Forge welding multiple pieces of steel together was once regarded as magic, to some it may still be, for it is not an easy task. Making those welds clean to the point you can’t see them and guaranteed not to break takes time and a lot of hot (very hot) sweaty work. I was fortunate enough to be teamed up with a skilled smith as a forge partner. He is a very knowledgeable talented smith that was there to reassure me when I was not sure about a step and keep me on track when my excitement made me skip a step. Like me he is focused on production so we did not spend a lot of time screwing off or wasting hits when the metal was hot. It was an amazing weekend for me one I will never forget. It was about so much more them making my first forged axe. I strengthened relationships with friends and made a few new ones. 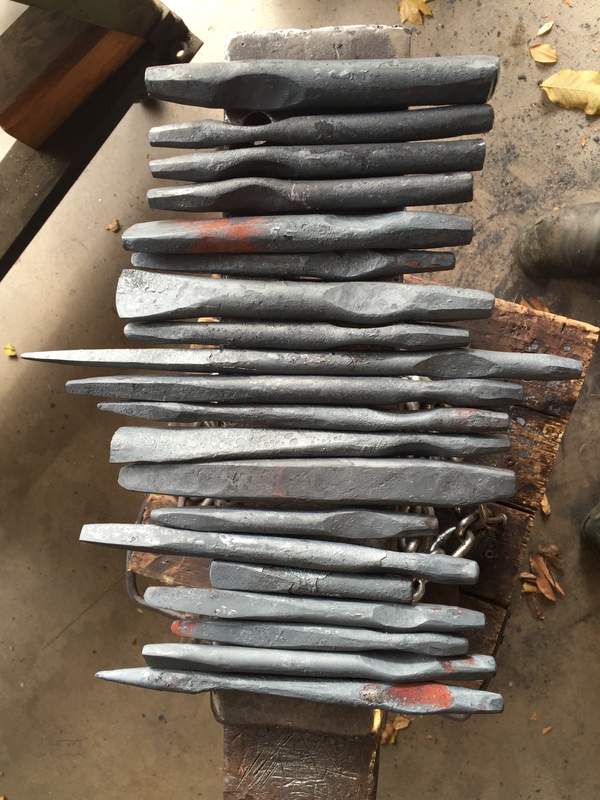 I learned some great techniques for forging high quality axes, but I also learned many things that will help me as a smith. I have a great axe that I will pass onto the next generation. The other half is threatening to build a forge at the bottom of the garden to make stuff like this. I somehow feel he will not stand much of a chance with limited (no existent) experience he has. Any tips for how to talk him out of turning the bottom of our garden into a forge? Speaking as the “other half” of this blog. Blacksmithing is loud, hot, and sweaty, it is not a hobby for the faint of heart. Than comes in from the shop with injuries to his hands on a weekly, sometimes daily basis. If these are things your other half enjoys, I am not sure how much help this will be! Good luck!